Forest Adventure hire equipment for their Adventure camps which are situated at the Biblins youth campsite. One adventure Camp sleeps up to 40 people. Forest Adventure can cater for larger groups on request. 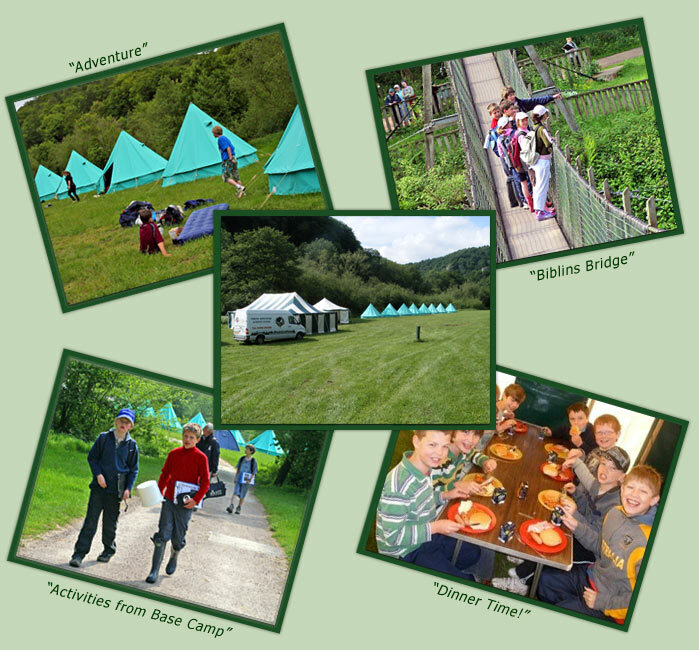 Biblins youth campsite is situated in the beautiful Wye Valley along a mile of riverside meadows four miles north of Monmouth, close to the famous Symonds Yat rapids. This location makes it one of the best places in Southern Britain for young people to enjoy outdoor education in spectacular scenery. Its seclusion in the depths of the Wye Gorge gives Biblins a very special "backwoods" feel. The site is situated in the Wye Valley, an Area of Outstanding Natural Beauty and is surrounded by the woodland of the Wye Gorge, a Site of Special Scientific Interest. A great base camp, for all your activities. Eight bell tents with ground sheets. One marquee for dinning and gathering. One kitchen marquee, fully equipped. One large six ring gas oven. Gas for oven and water boiler.